"The Oasis Within is hands down the best book I have ever read. THANK YOU!" Julia Ware. September 10, 2016. Exceeded my expectations. I liked it so much, I gave it as a gift to 3 graduates, high school, college and grad school. Great advice for anyone beginning something new and a wonderful story too. Love Tom Morris. I’m a very skeptical person when it comes to novels; and, those who know me would never imagine me reading one of a philosophical nature. However, I am certainly glad I cracked this one open. A chapter a day turned into several an hour and afterwards I found myself reviewing specific parts of this wonderful book. Tom Morris brings us an epic tale of a boy and his uncle crossing the desert while exploring philosophy at its best. I highly recommend this book to anyone looking to grow or just enjoy a good story. You’ll find it to be packed full of insight and may even take on the role of student while reading it! Destined to be a classic read, The Oasis Within will not disappoint!! Amazon 5 Stars from Alex Sewing on June 30, 2017. Must Buy. I was fortunate enough to see Tom in person at ASSE Safety 2017. He was incredibly captivating in his keynote speech—so I bought his book without hesitation. Turns out, he is equally as captivating in his writing. The Oasis Within is a MUST BUY! Wonderful reading—looking forward to the series! I started this book last night in the Atlanta TSA line. Got a third of the way through it before I put it down on the plane trip home. Very good book for anyone, and especially me. So many pearls of wisdom within spoke directly to me. There were sentences I had to read over a couple of times because their application to my life could have a profound affect. Anyhow, thanks for sharing it. As I sit in my special "oasis," I pull out a book, The Oasis Within, from Tom Morris, that couldn't have been a more perfect fit for this moment in my life. Coming off an especially trying "adventure," I'm reminded, one chapter in, of the importance of living life in the present and choosing a good perspective. While I'm in a physical oasis now, it's in my power to carry my oasis with me all the time. Thank you Tom! You're a wonderful speaker and a great author. Check out the shirt pocket of the young man on the escalator in Philly. He grabbed the card from his dad's car. Never too young to start cultivating The Oasis Within. David Buchan ‏Jul 1 ON Twitter: This, like your other books, reminds and supports me so I can be a better person. They connect me to the fire within. Tom V. Morris is not your typical philosopher! He is also a brilliant writer. He is a combination of Kierkegaard and Socrates, J.K. Rowling and Aristotle! The Oasis Within will touch your soul like few others can. It addresses areas of meaning and suffering and how we should deal with the worst of times and the best of times; what wisdom is, why we should not shun uncertainty, our personal identity, and how to find an oasis in the storms of life. Tom tells great stories with striking examples to give us all guidance, and does not fall into the common secular misconception of “follow your heart” without regard to consequences or objective moral or natural codes. His main character at one point says, “We all have feelings and desires that come and go. This is why I speak of following our deepest and most proper feelings, not just any emotion or inclination that crosses your heart. …. I’ve learned to put aside immediate temptation for the sake of long term good. It’s not an easy thing to master, but it’s one of life’s most important skills and it brings the deepest satisfactions.” Amen to that! If you are not reading this book, then you are really missing out on one of the twenty-first century’s very best examples of Philosophical fiction -- period! Khaldoun A. Sweis, PhD, Associate Professor of Philosophy, Olive-Harvey College. Tutor in Philosophy, Oxford University, UK. Singer Caroline Klehr with The Oasis Within, a bit of summer reading on a warm sunny day, poolside. "Thank you, Tom, for writing this masterpiece for us. Full of words of wisdom that we can use in life." 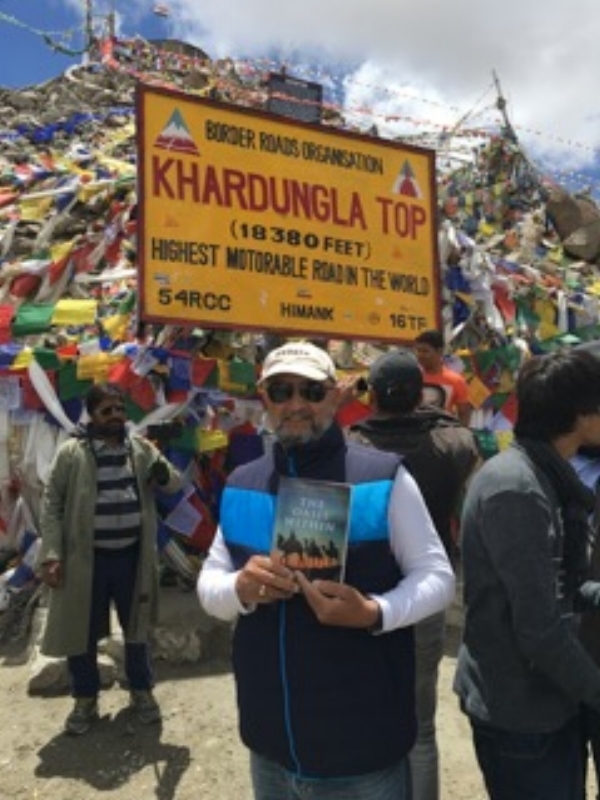 - Vinod Rangra, pictured below reading The Oasis Within in the Himalayas. Bangong Lake @ 14,000 ft near the China border. An adventurer reads The Oasis Within for even more inspiration than the setting provides. Imagine a novel so chock-a-block with wisdom, cool characters and dramatic tension--oh, wait. You don't have to imagine. It's here! Tom Morris's novel is beyond fine. It's a great story (or I should say the beginnings of a great story; rumors of many more books to come in a series!) in Tom's polished prose and--best of all--filled with deep, gentle words of the deepest, wisest life-perspective. Tom! We are waiting for the next in the series! Bring it on! UNC Morehead-Cain Nominee Richard Livingston reads and highlights The Oasis Within. In one of the darkest times of my life, The Oasis Within became my oasis of peace. It reminded me to turn the (inner) telescope around for a new perspective, and to always remember “We can’t control the day, but only what we make of the day”. It’s a book I will continually go back to. Dino Muccio, stunt man, The Hunger Games, Insurgent, The Bourne Ultimatum, The Sopranos, and many other films and TV shows. Stunt coordinator, The Choice and many other films. The Oasis Within is concise practical wisdom written as a story-telling novel of adventure. It's practical application runs a wide gamut, but it speaks to me most loudly in terms of leadership and change management. It is one of several Tom Morris works that have led me to consider him to be one of my "paper mentors." Just read it, you will be glad you did! I started reading The Oasis Within on Wednesday and finished it last night. What a gem! It is on my re-read shelf and I plan to share it with my sons as a valentine gift cause, after all, the real secret In life is to carry an oasis in your heart every day. As I read the reviews of Dr. Morris’ wonderful book, The Oasis Within, I found myself nodding “yes, yes, yes”. Superlative writing and matchless lessons are combined in leading us into the promise on a profound experience in wisdom literature. Having been introduced to this modern day thinker in his book Philosophy for Dummies, I was prepared for something special. I got more than anticipated. This first in a series, Walid and The Mysteries of Phi, may be Morris’s initial venture into fiction but this book moves us far beyond fiction. We are carried into a world of a different culture in a time and place not completely remote. There we are invited to share in such fundamental understandings of the human condition that we must ask “Why did no one ever explain this to me in this way?” He writes with love and power and may be offering a menu for moving beyond the stagnate morass that seems to define the way some see our world today. A great read and a wonderful start, Dr Tom. Give us more. A busy business executive reads The Oasis Within, along with his small son, February 2016. This book takes you on multiple journeys; not only the ones Tom guides you through with his stories but how you attach your own life's stories to them as well. This is a book you'll read more than once as a reminder of what's truly important in life. I can't recommend it highly enough! This is an amazing book and one that truly gets you thinking about what's most important in life. Tom Morris is a brilliant writer and weaves his stories in such a way that you will change your perspectives dramatically and for the better. Kendall and Matt, ruling their tennis center and finding inner calm with The book, The Oasis Within. Dr. Morris, Dr. Morris, Dr. Morris!! WHAT A BOOK!! The Oasis Within is absolutely amazing!! What a page turner!! I couldn't put it down!! I read Chapters 5 and 6 in the airport and almost shouted (Black Baptist style lol) right there in the terminal. Around Chapter 9, I thought "how did he come up with this?" So I googled the book and saw your Huffington Post write up. The spirit of the Lord is real!! I shared the Four Elements, the Triple Double and 7C's with my mom's GED students. After all, wisdom is for sharing! And they ate it up like hot KrispyKreme donuts!! It seemed to resonate deeply with them. Last night I finished the book, thousands of feet in the air as I traveled back to NJ from Chicago. "What I wish to be, I am!!" "Much was yet to be revealed!" Often times tears blurred my vision as I pressed my way to the next page. I say all of this to say, this book was meant for me. It was tailored to bless my soul for such a time as this! I didn't know what to expect when you said this was your best work yet. But Doc, you've outdone yourself, sir!! And wait, this is only the PROLOGUE!!???????? WOWZERS!! Much has yet to be revealed!! 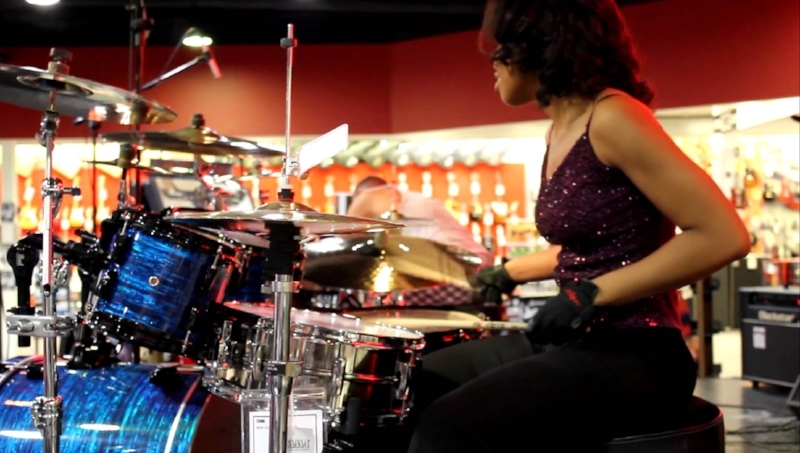 Ms. Taylor Moore, Standup Comedian and Jazz and R&B Drummer, New York City area. I am tickled to read the reviews on Tom Morris' new novel - THE OASIS WITHIN! I have read the book and I keep using the word PROFOUND! I highly recommend the read and the series remaining to be read! Move out of the way Harry Potter is all I can say! This is real, authentic, and PROFOUND!!!!! Mountainside philosopher with both The Oasis Within and The Golden Palace! Great to see! I have read "The Oasis Within" twice already - it's filled with pearls of wisdom. A retired eye specialist answers the question: "Are these books good bathroom reading?" with a resounding "Yes!" He also believes the wisdom of the books to be "commodious." International businessman Vinod Ranga with The Oasis Within high in the Himalayas. This book by Tom Morris sets up what looks to be a great series of novels, and includes some priceless wisdom as well. A great read! Tom - Thank you for giving us the beautiful lessons of THE OASIS WITHIN. Uplifting the Spirit of Life, demonstrating the inner strength aiding survival, and showing the life choices we all face - all serve to teach us to appreciate where we are at any time in our lives. For decades, Tom Morris has been America's best-known public philosopher. No one today does a better job of making the powerful ideas of the great thinkers come alive to general readers. This slender book is Morris at his best. Here he distills, in story form, his most important insights into living a rich, purposeful, and fulfilled life. This is a book to be read and pondered in sips. If the book series is nearly as good as this companion volume, readers are in for the journey of a lifetime. Hello from Austin! Just wanted to tell you I am almost finished with the book and I LOVE it!!! As a matter of fact, I’m going to buy one for my family and let a friend (or two or three) borrow the one you sent me. What a feel good, positive, perfect perspective on life! This is not only beautiful, but winsome, even charming! THE OASIS WITHIN, by Dr. Tom Morris is his first book of philosophy written in a fiction format. Being a first, one would think there would be flaws in the attempt. However, there are no flaws here. Just a beautifully written piece of fiction filled with complex philosophical concepts broken down into language easily understood by young and old alike. As Walid and his Uncle Ali, cross the desert with a caravan, there is ample opportunity for Uncle Ali to share his wisdom and experience with young, Walid. Each vista and new experience provides a venue to explain life management techniques to his young nephew. That the book tells a story and still instills one with the wisdom of the Stoics, provides for some very interesting reading. I will share this work with my eight-year old grandson and use the book as a mapping system for helping him to better cope with society and live a happier, healthier life. I am excited to see Dr. Morris finally take his wisdom and experience into a fictional format. He has said there is more to come in the “Oasis” series and I for one, cannot wait for the next installment. @TomVMorris #grateful. Loved reading The Oasis Within. And what a series it will be! Like a DIY Guide to Paulo Coelho's The Alchemist! Tom Ciszek @ciszek. Amazon 5 stars. We Need More Books Like This. By Dr. Bill Irwin, Founder and Editor of the Blackwell Philosophy and Popular Culture series and Herve A, LeBlanc Distinguished Service Professor and Chair of Philosophy, King's College, on October 12, 2015. Verified Purchase. We need more books like this. Academic philosophy lost track of wisdom a long time ago. And most literature is lacking in ideas. THE OASIS WITHIN is a work of Phi-Fi, philosophical fiction. The journey across the desert is the opportunity for dialogue between a boy and his uncle during which we learn that “Uncertainty is the canvas on which all our lives are painted.” Fans of Tom Morris will recognize his 7 Cs of success and other gems. Dear Tom: Oasis is a journey of the soul's need and truth. Thank you for sharing this walk through life's lessons in wisdom and awareness expressed. Looking forward to more! Warmly, Bernie and Sydney Nykanen, www.colorfulcreationgallery.com. I have enjoyed reading the new book by Tom Morris! I wish I can make a movie on it!! It shows how nicely the elders can pass on wisdom to the next generation and also how to tolerate and respond to the inquisitive minds of the younger generation. It is very much a thesis on leadership!! Regards, Mohan M. Phadke, India. Tom Morris has done it again with his extensive literary skills and creativity! Don’t miss his new fictional series of eight books creating believable characters set in Egypt during the 1930’s. This continuing saga offers exciting adventure and discovery while mixing philosophy, motivation and spirituality into a great tale soon to be enjoyed by the masses. I started his first book and quickly fell in love with the individuals he had created and their sharing of wisdom and knowledge about life. Then I got to see the other novels before they even got into print. Reading Oasis where you can hardly breathe, at an altitude of over 18,000 feet, high above it all. If you could take the great wisdom of the world and teach the best way possible, it would be in story and experience. This is what Tom V. Morris has accomplished with The Oasis Within: A Journey of Preparation. It is a story of a wise uncle and his nephew as they caravan across the desert in the 1930s. They speak of the deep things of life, all very philosophical, yet without it being a lecture or a set of abstractions. This is like a conversation taking place with a close friend as you make a long road trip. As a result, it is an ideal book for conversation between people. Like The Little Prince and Jonathan Livingston Seagull By george manning on September 8, 2015 Format: Paperback The Oasis Within is filled with thoughts for right living you would think a philosopher should know. Uncles, aunts, and all other teachers will think of their charges and smile. The distilled notes in Walid's diary belong on every teenager's mirror and every family's refrigerator. Like The Little Prince and Jonathan Livingston Seagull, The Oasis Within won't get dusty. I liked the book from the beginning, but was jolted to attention when the story included intrigue and danger from a kingdom coup. I was disappointed when the book ended, but pleased to know . . . more is to come and much is yet to be revealed. I'm looking forward to it. I am listed as one of the top book reviewers on Amazon and I can say without hesitation that this book would be in my top 10 of all time. I read more than 100 leadership/philosophy/self-help books year and have every year since 1989 and The Oasis Within is a compilation of the very best ideas I've seen through all those books wrapped up in a wonderful and engaging story, with compelling characters and truly life-changing lessons. This is a superb book for any adult, but if I had teenager I would get this book for them immediately. If you have read The Profit, The Richest Man in Babylon, the Four Agreements or the Alchemist and enjoyed them – this book will absolutely delight you. I honestly believe this book is destined to one day be considered among the best ever written on personal success and a life well lived. This book has my highest possible recommendation. It is refreshing to read a book that includes helpful/philosophical knowledge that can be applied to everyday life! I cannot wait for the second book to be published. Tom: Reading The Oasis Within made my weekend better. You are such a brilliant writer. There are nuggets to take away on top of nuggets in everything you write. What a gift, Tom! - Donna Karlin, prominent author, speaker, and leadership coach, Canada. I have almost finished reading this to my kids. They have loved it. I think it has inspired more conversation about important things than any book we've ever read before. We'll done! You are doing wonderful work. I highlighted quite a few passages in The Oasis Within that resonate with my experience. Keep it up! - Todd Long, Professor of Philosophy, California Polytechnic University.